This entry was posted in Books, Japan, Non-Fiction, Reviews, Women Unbound Challenge and tagged geisha, gion, Japan. Bookmark the permalink. 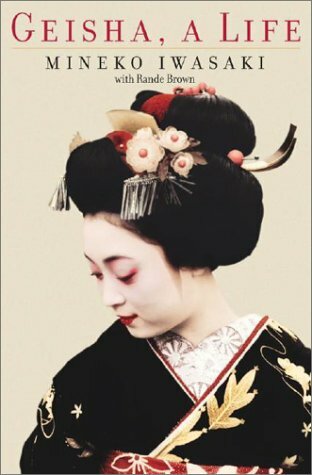 I haven’t heard of this one, but I love reading about Japan – especially Geishas! I’ve added this one to my wishlist – thank you! I liked Memoirs of a Geisha and I had also heard that this was the “real” depiction of their life. I have wanted to read this ever since. I’m glad you enjoyed it, I’ll have to keep looking for it! I really liked Memoirs of Geisha (movie too) so I think I will read this book. It would give a different perspective of the story. i loved meoirs of geisha … both the book as well as the movie.. the movie had lovely imagery and haunting background score and was better than the book.. this just sounds right up my alley !! I didn’t know this book was the story of the Geisha on who Golden more or less based his story. This makes me even more curious to read it, especially after reading your review. It sounds like a great read. This sounds absolutely amazing – thank you for bringing it to my attention! To the wishlist it goes. Great review, Violet! I enjoyed Memoirs of a Geisha, so I’m upset Arthur Golden did not respect Iwasaki’s privacy. I don’t know if this is the sort of book I’d enjoy, with all the dry facts and an egotistical narrator- but I’m glad she set the record straight. I’m glad to hear that she spoke out against the misconceptions Golden projected. This definitely sounds like something to read to get a real view of the Geisha. I read this book! When I was a prof’s assistant, she was putting together a class about the art of the geisha, and I had to write out an annotated bibliography for her with suggestions on which would be the best books for the class. I completely agree with you; this book is fascinating and completely engrossing. The lives of geisha are really fascinating and who better to learn about it from than the best geisha of her generation? This sounds really good. I haven’t heard of it and I love learning about other cultures. And I love that cover! This sounds fascinating and I didn’t know Golden’s inspiration had written her own book. One for noting down for future purchases definitely. What a fab companion/contrast book to Golden’s! which I loved but I have yet to see the movie. Great review. Great review, Violet! I’ve read Golden’s book but didn’t finish it, but that’s because I was reading it at the bookstore. I have it in my TBR. This one you’ve just reviewed sounds very good. I loved Memoirs of a Geisha so I have to put this on my wishlist. It got me really fascinated in Geisha culture. I enjoyed Memoirs of a Geisha, but confess I thought the ending was rushed. I hadn’t realized the little controversy surrounding it though in regards to this author’s actual story. I definitely am interested in reading her autobiography. It sounds very informative. And obviously it must be good to earn such a high rating from you! Thank you for your great review, Violet. I haven’t read either book, just something that I have wanted to read, but never actually got around to it. I do feel bad that Arthur Golden has violated his agreement that he had with Mineko. Good that she didn’t take it lying down and has written her own book clarifying her point of view. I read Memoirs of a Geisha ages ago. I think it would be neat to read the “real” story. Thanks for bringing this book to my attention. I LOVED Memoirs of Geisha and I dnt think I ever got bored of reading passages such as the one you point out here… they are jus beautiful! This is going into my wishlist…. I really really would love to read more. I think Geisha’s life and times are fascinating to read about. Is this The Steve Millen Who performed at House of Andrew in Bellevue in the 70’s? Wrote songs like “Petunia” and “Damn isn’t God’s last Name? ” Hope you are well. I have thought about you through the years. and will be tweeting this to my followers! Fantastic blog and great style and design.